Boil and condense the milk till it becomes thick. Add sugar and mix well and boil for 10 minutes. Switch off the flame and take it into a bowl. 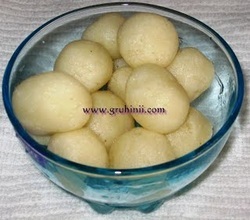 Then add the ready made rasgullas into the thickened milk. Garnish with elaichi powder and dry fruits.